Hello, welcome back. 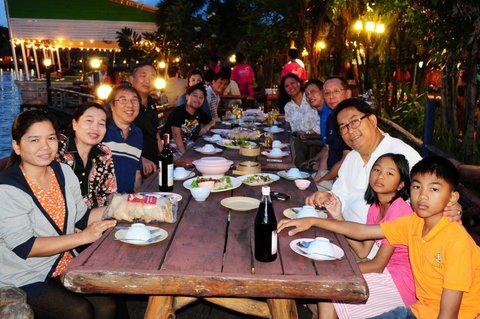 On the last night before we left, Korat we had a sumptuous dinner with wonderful company at a place with a setting that is truly unusual. 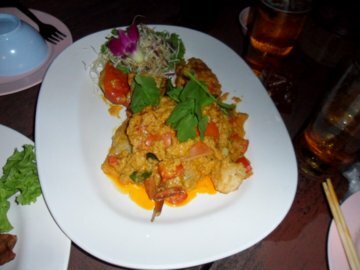 Seeing is believing, so let us share this dining experience with you. 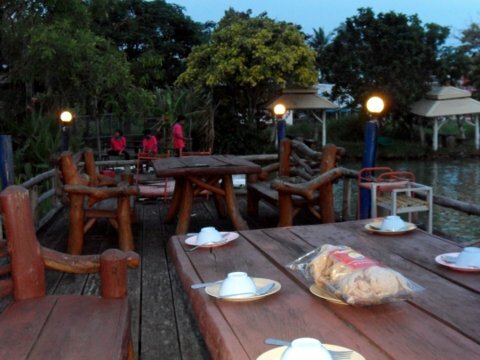 Wang Matcha* Restaurant is in Korat city about four km from the city centre. I don’t usually write about wining and dining but this is one place you will want to write home about and share with your friends. 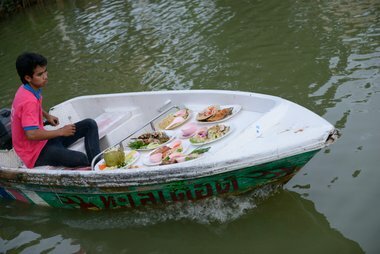 I haven’t come across a restaurant like this in Thailand. Let’s see what’s so special about this place. Be my guest and join us on this virtual tour. Here’s a satellite map to give you a birds’ eye view of the restaurant. 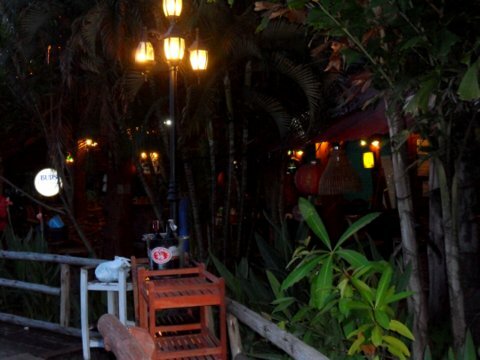 The whole place has a natural ambience with lots of trees, plants and garden lighting. 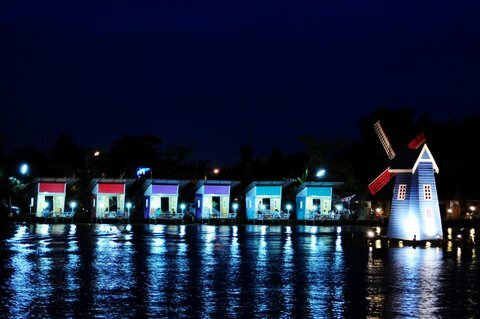 There’s a windmill in the middle of the lake that’s lighted up at night. 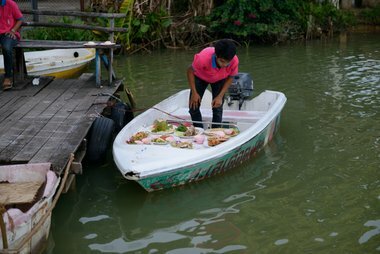 Simple, food is delivered by speed boats racing across the lake. I’ve seen a boat with a steamboat pot full of hot soup going at full speed without spilling a drop. With that introduction, shall we have dinner? 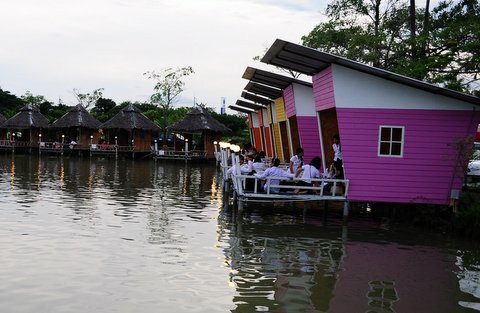 As we were quite a big group, we chose to eat at the open air platform just by the lake near main building. 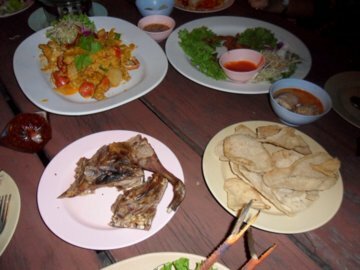 It was a generous and delicious spread of seafood and other delights, curry crabs, barbecued prawns, squid and waxed duck washed down with lots of fluids. 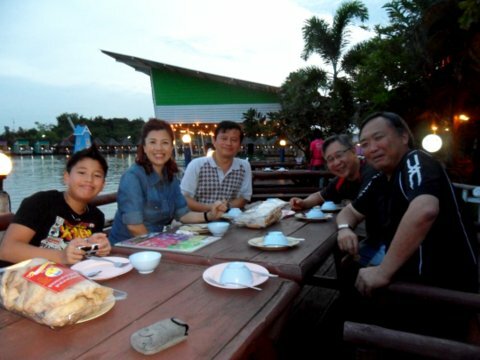 We had a big group of 16 friends from Thailand, Malaysia and Singapore and we all had a wonderful evening. As for the cost, we’ll have to ask my cousin Mark. 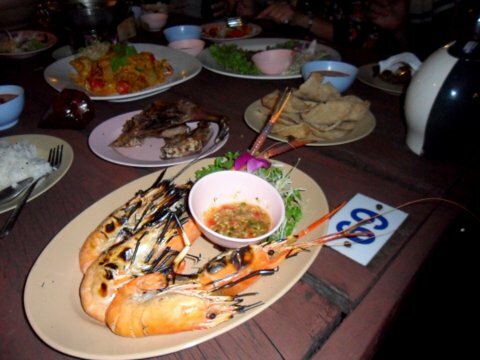 It was his welcome dinner to Thailand. 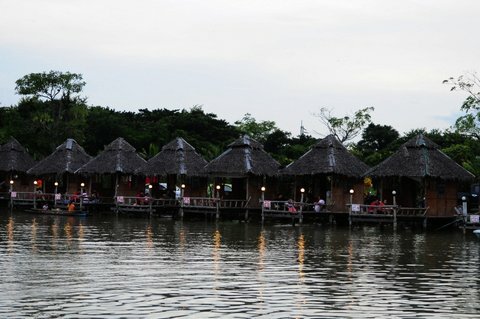 Thank you for joining us in this last issue of Bangkok Travelbug for the year 2013. As we close the year 2013 and look forward to a better 2014, may I leave you with a memorable image of Wang Matcha as the evening drew to a close. 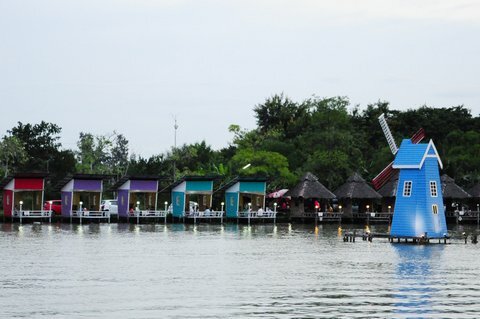 Take Highway 2 or the Mittraphap Highway to Korat city which is about 260 km from Bangkok. 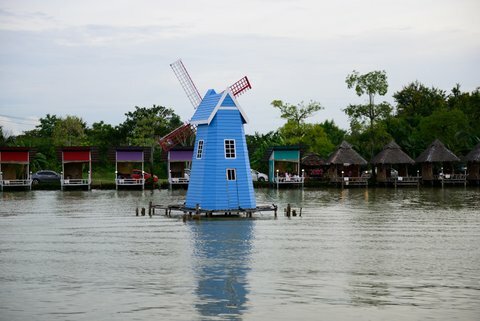 It’s about a three hour drive to Korat city. When you get to the city continue of Mittraphap Highway past the Korat 2nd Bus Terminal and Makro Store, turn left into Chang Phueak Road and left again into Siphat Road. The Wang Matcha Restaurant is on the right. If you are using public transport, there are express tour buses from the Northern Bus Terminal at Mor Chit in Bangkok to the Korat bus terminal 2 (new terminal). This takes about three and a half hours and doesn’t cost more than 200 baht. If possible don’t take the air-conditioned non-express bus (class 2). It takes almost four and half hours (fare 171 baht). The mini-buses from the Victory Monument take three hours but terminate at Pak Chong (fare 180 baht). You will have to take another mini-bus to Korat city (fare 60 baht). Mini-buses from Mor Chit go directly to the bus terminal 2 in Korat city. The most convenient form of public transport is the tuk tuk. These are available at the bus terminal and also at major junctions. If you are going to an out-of- the-way place like the Petrified Wood Museum, you’ll need to charter the tuk tuk for a return trip. Agree on the price before boarding. I am grateful to Wong Keng Cheong for contributing the beautiful photographs of the restaurant for this article. My thanks to cousin Mark for the wonderful dinner and the enjoyable dinner companions from Malaysia, Thailand and Singapore. Merry Christmas and Happy New year to all readers and friends of Bangkok Travelbug, have a warm and pleasant holiday with your family and friends. May the year ahead be filled with peace and goodwill. We visit the Sri Satchanalai Historical Park, a UNESCO World Heritage site in Sukhothai.